Community Organization of Pasadena for Advancement in Education (COPA) was established in Pasadena in June, 1981. 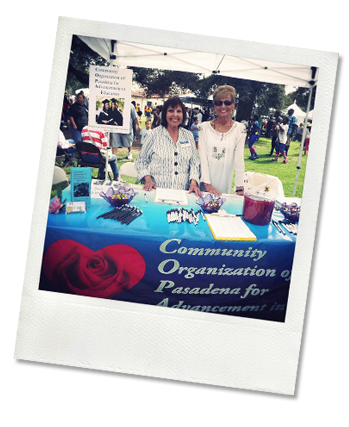 The purpose of COPA was to direct it's efforts to organize Community and Professional Women of Pasadena to assume leadership within the community to help disseminate news and information regarding Latina/Chicana issues. COPA promotes programs, provides resources and financial support through scholarships that will empower young Latinas to achieve higher education. Since it's inception, COPA has been providing scholarships to deserving young Women entering college. In 2012 COPA presented scholarships to deserving Seniors in each of the five High Schools in the Pasadena Unified School District. The 2012 recipients are planning to attend UCLA, USC, PCC, Texas Christian,, UC Santa Barbara and Georgetown in the Fall. COPA will be recognized by the Pasadena Mexican American Heritage Association for their contributions to the Pasadena Community through a dedication of a bench at Gwinn Park in Pasadena in the Spring 2013. Please check our events page for information about the dedication. Our Mission is simple...to empower and support through scholarships, Latinas entering college.